How To Build a Shed Roof With One. Framing in a ridge beam in shed roof construction is not hard. Here's a picture of a gable style shed using a ridge beam. 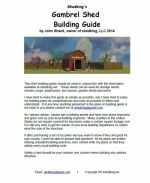 Now if you have done any looking around this site, you'll quickly see that I am not a fan of using a ridge beam in shed construction. I always, always build trusses. Its the way I was trained to build sheds. 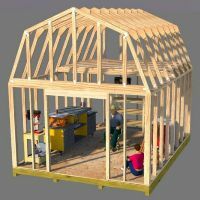 I am not saying it's the best way, I just know how to build sheds better by using trusses for my shed roof construction. 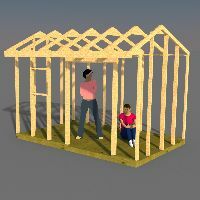 By the way, if you would like to see how I build shed roofs with trusses, check out the following link: How to Build a shed roof. I can't ever recall seeing a saltbox shed built with a ridge beam, or even a gambrel roof shed for that matter. 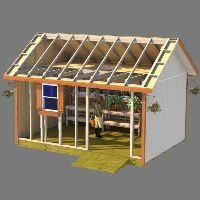 Come to think of it, the only style shed I can see that would be easy to use a ridge beam is the gable style shed. 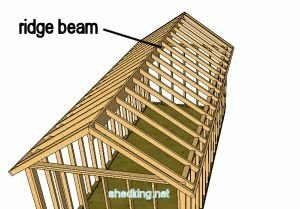 Leave ridge beam for shed construction page.